How British farmers can gain financial benefits from waste energy. Biogas generation specialist ENER-G has published a free guide to help British farmers gain financial benefits from turning farm waste into energy. Biogas generation specialist ENER-G has published a free guide to help British farmers gain financial benefits from turning farm waste into energy via anaerobic digestion. 'The Essential Farmers' Guide to the Financial Benefits of Waste Energy' details the financial incentives on offer. These include the government's Feed in Tariff (FiT) and Renewable Heat Incentive (RHI), which can provide an attractive 20-year income for renewable energy generation. Other incentives are also highlighted, such as grants to assess feasibility of on-farm anaerobic digestion and business planning. Farmers can use the guide to find out what factors to consider when assessing the economic viability of anaerobic digestion, including costs and potential savings, funding, planning permission, types of organic feedstock, and the benefits of replacing chemical fertilisers with the nutrient rich digestate that is a by-product of the anaerobic digestion process. "Renewable energy from waste offers farmers an opportunity to bring in extra revenue and stabilise costs," said Martin Wager, Business Development Manager for ENER-G Combined Power Ltd. "Evaluating the commercial case for anaerobic digestion is complex, so the guide covers the key questions farmers should ask and the support they can tap into." 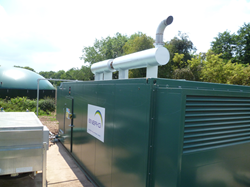 He added: "Anaerobic digestion may appear to be a complex and high capital option, but the technology is well understood and public and private funding is readily available. Farmers must do the maths, but luckily grants are available to help develop a business plan." Download the farmers' guide to financial benefits from anaerobic digestion.